Wakeskater Studio Indie Game Development: [SBX:I] Balancing the Numbers on Turrets - Save&Load Game - Level Select! [SBX:I] Balancing the Numbers on Turrets - Save&Load Game - Level Select! So I got a bunch of the dumb stuff out of the way I wasn't wanting to work on, like the Save/Load system and the Level Select screen. They're both very simple systems. For the save and load you can only keep one save file, if you make a new game it immediately overwrites the old load file. (It tells you this if you click New File). 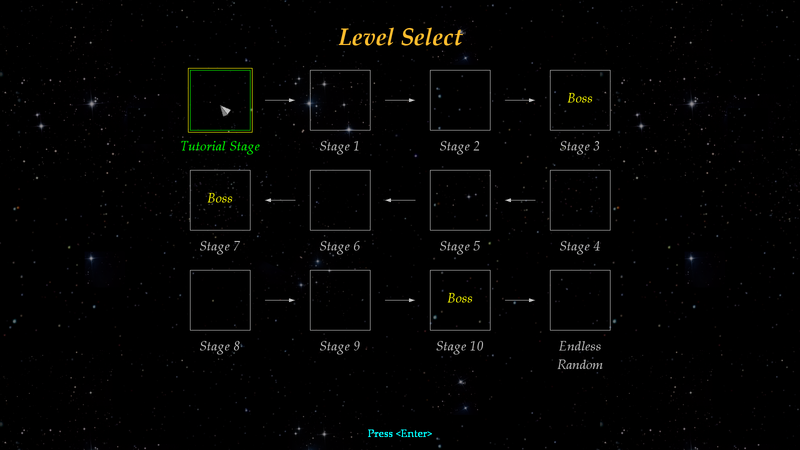 The level select screen is fairly simple as well. 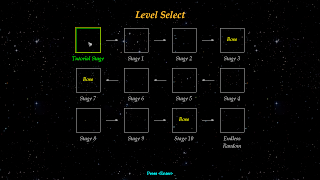 You can use the mouse or the arrow keys to move the selection box around and then Press Enter to enter levels that you have unlocked. For now there is just a screen for the Main Campaign. Later I am planning to add challenge modes and there will be a button to swap the level screen to those levels. For now though it is set up to handle 10 main levels and an Endless Random Level once you beat the game. Also I reduced the HP on the Level 3 boss a bit. He was a TAD too hard for only being in level 3. That said he will still wreck your face if you don't plan it out right. The other big thing I did this weekend was balancing out the Turrets. 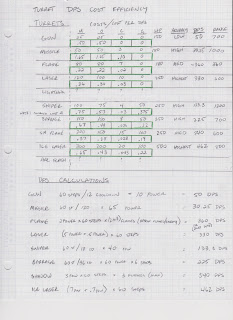 Since I think it's an interesting and fun thing to do, I'll show you my notes on how I went about balancing the turrets. The stat I wanted to see was DPS per Cost in each category. 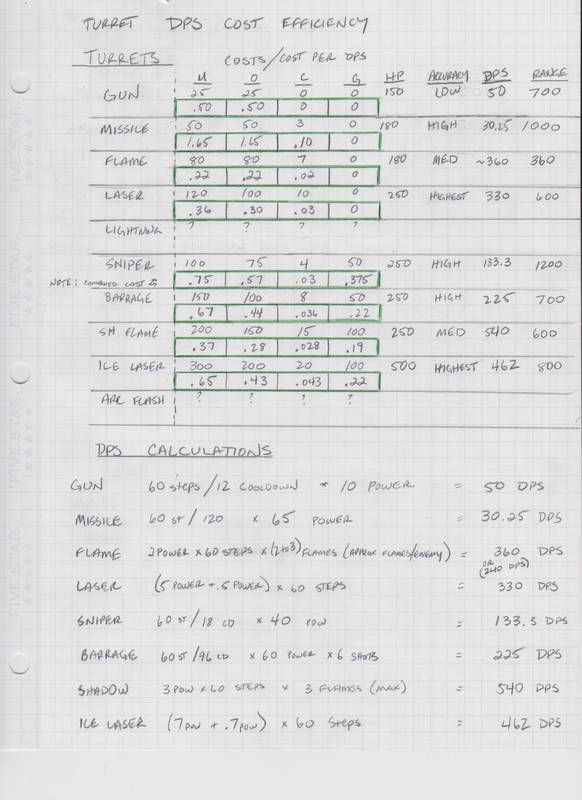 So I calculated DPS for each of the turrets and divided the cost by it to find the DPS Cost Efficiency. This stat shows how much DPS you are paying for with each piece of metal/gold/ore/core. I wanted to see this to see how the DPS Cost Efficiency was matching up to other benefits of towers. For example if the Flame Turret is more efficient than the Sniper Turret, that's fine because it has a short range and can't hit through walls. So here are my notes (by hand in my notebook, yeah I'm old school). The DPS Cost Efficiency is bordered in green under the total cost of the turret (for upgraded turrets this is base turret cost + upgrade cost). These findings were particularly helpful in balancing what I wanted out of the turrets. The main things I was looking at was the efficiency in the Gold, Core and Ore categories. The Metal is not as significant but it at least gives me an idea of what you are getting. I might increase the metal cost for a few turrets that have high HP (like the Ice Laser Turret). Reason: The sniper turret was TOO cost efficient with Cores for its massive range and accuracy. It was slightly Gold inefficient compared to other turrets so i reduced that slightly. Reason: The missile turret was very inefficient and not providing a whole lot of DPS. This change increased the DPS from 30.25 to 50 and brought the turret a bit more in line with other turrets. It still isn't the most efficient, but it has good range and now has an efficiency of 1 for Ore instead of 1.65. Also I am keeping an eye on the Shadow Flame Turret (It's really efficient and does great dps and attacks through walls. The costs might need to be bumped up a bit. I'll do calculations on the benefits of the generators as well in the future. Also I'll need to plan out the Lightning and Arc Flash turret when I make them (they aren't in the game yet) ;-). The Lightning Turret and Arc Flash Turret will be the best AoE turrets in the game but they'll be really expensive. I might add an upgrade for the Sniper Turret as well to give you 11 turret options so that it matches up with generator options. That's a little insight into what's new. You can save your game now in the new file! For the next few updates at least when you download the new file, you should be able to overwrite the data.ini file in the new one with the old one to keep your save data. Just drag and drop it over and replace the old one. Until I make major changes (like challenge levels) this should be fine.